For the dressing, mix the vinegar, lemon juice, olive oil and salt in a bowl. Then combine all of the remaining ingredients and dress evenly with the prepared vinaigrette. Keep refrigerated for at least one hour to let the sabores combine. Between the hustle and bustle every day, sometimes it's difficult to prepare home-made food for work. 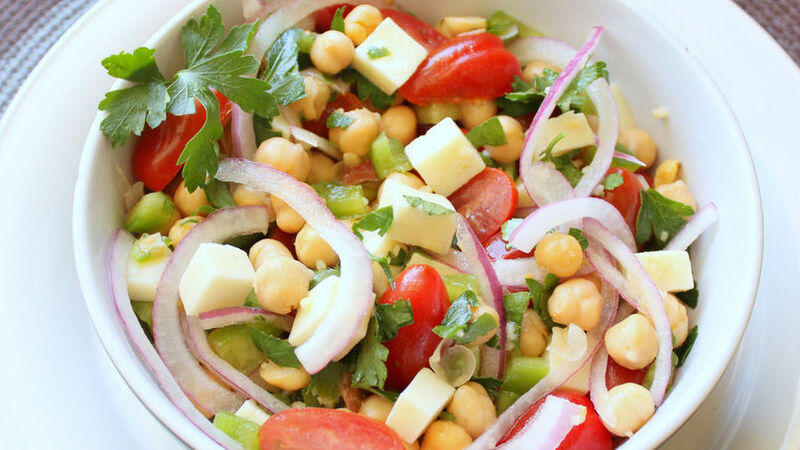 I'm always looking for ways to save a bit of time in the kitchen without sacrificing the flavor in my meals-this chick pea salad with Provolone cheese is one of those ideas. It's fresca, colorful and deliciosa, but best of all you'll have your lunch fixed in just 15 minutes. Besides, it's great for escaping the hot temperatures outside; I hope you'll try it!